Q: Congratulations on the release of your dynamite new album, “A Matter of Time.” I’ve had it on repeat since it was released. Now, before embarking on this [swing] through California you’re on, you spent six weeks promoting the album and touring Europe. Pictures of your [European] performances show massive, sell-out crowds. Do you and your band prepare and perform any differently when you’re playing to massive crowds like you were in Europe as compared to a more intimate setting like [tonight at] the Dub Club? Protoje: It’s a good question. If it’s a club show, we have more freedom, we have more time. There’s no set clock on you. You can say: “Let’s play this song, or yo, yo, let’s try something else.” And [with] the festival, it’s a bit more structured. Because we have a set time and we’re trying to do certain things. And [with] the festival crowd, you’re playing to many of your fans, but [also] many people who don’t know you. And you’re trying to get them [to] know you well. At the club you’re playing to everybody who already mostly knows you. So you can be a bit more chill and try other stuff. But I would say we prepare pretty much the same; we just freestyle a bit [more] in the club setting. Q: People unfamiliar with the music business often assume touring is all glamour and glitz. They don’t appreciate the grind. You have a young daughter; what sustains you on the road when you’re missing her and dealing with the struggles of constantly being on the go? Protoje: Just staying in the [present]. I don’t really know what day it is or what I have to do tomorrow. I stay in the moment, really. So, like if you ask me, “Where are you playing two weeks from now?,” I won’t know. And I think it’s overwhelming. I’ve only been to Jamaica for one day in almost four months. Q: I saw when you tweeted that; you said you were only there for twenty-four hours! 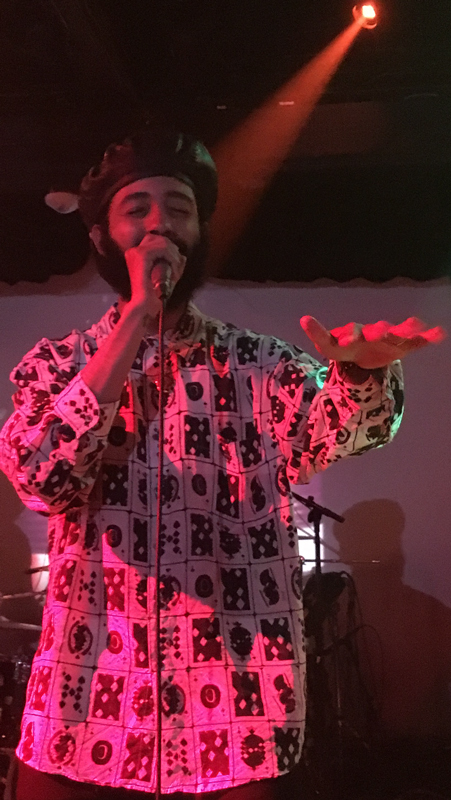 Protoje: I went for twenty-four hours and I left. Q: How can you even pack a bag for that – that’s crazy! Q: Maybe because of my former career as a criminal defense attorney, one thing I’ve always been curious about when Rastafarian reggae stars and musicians tour internationally, is: What precautions do you take as it concerns marijuana, seeing that, even in 2018, it still remains illegal in several countries and in some states in the United States? Protoje: Don’t have more than you can eat. Q: (Laughing) Ok, I won’t say more [about that]. But seriously: does someone touring with the band double-check the [marijuana] laws [and regulations] when you travel from one place to the next? Protoje: Yeah, yeah. Especially in America. Because it’s funny, it’ll be legal here [in California], but then you cross state lines where it’s not legal; so we kinda have an idea. You don’t want to be in Utah on tour with a lot of marijuana. So we always try to keep it to a small amount. And then in Europe, we don’t carry it when we travel. We go to a place and we get it, and we move on. You have to be safe, especially being a reggae artist. Being on a “fragile” passport, you know? Q: In all the touring you’ve done promoting your four albums over the years, have you or any of your band members had any run-ins [with authorities], confrontations, or close calls you can talk about? Q: But it hasn’t hit the news? Protoje: No, we’ve never really got to that point. We’ve just been blessed. So we always try to be careful. People are experienced, so they know kinda how to cover themselves. Q: I wanted to ask about this because one of my favorite songs from off of your first album [“Seven Year Itch”] is “Wrong Side of the Law.” It’s a very prescient, forward-looking track about you being booked over a hundred-dollar bag of weed and a chalice. Q: In an interview (on the BBC with David Rodigan) you said that the experience really happened to you? Q: Knowing your mom [Ms. Lorna Bennett] is not only a famous Jamaican singer herself but also an attorney, one of the first questions I had about this is: was [your mom] angrier with you or the law when this happened? Protoje: Well the fullness of the story is that it was me and my tour manager, [Jamaican author] Dutty [Bookman]. So he was the one that they booked. It was his bag. So when he was getting arrested and we were in the station he had his notepad with him. And he always writes. So I was like, “jot [down] everything you see or hear.” Everything they said, the guy’s badge number, everything they said he was writing little notes of it. And then he wrote a story about it, like a little short story. Protoje: It was never published, but we have it. I’ll [let] you see it. And the story starts when he [writes]: “Today Dutty found himself on the wrong side of the law by the beast who manifested itself in the form of the police.” And that was the first line of the story. I heard that, and then wrote the song. Q: Was [Dutty] ever able to get that charge cleared up – cleared from the official records in Jamaica? Q: Those are the lyrics in the song!